The Chocolate Hills is an unusual geological formation in Bohol province, Philippines. According to the latest accurate survey done, there are 1,776 hills spread over an area of more than 50 square kilometres (20 sq mi). They are covered in green grass that turns brown during the dry season, hence the name. 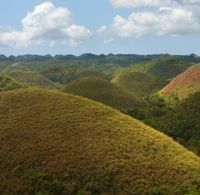 The Chocolate Hills form a rolling terrain of haycock hills – mounds of a generally conical and almost symmetrical shape. 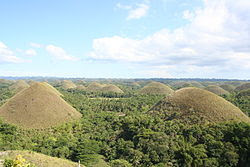 Estimated to be from 1,268 to about 1,776 individual mounds, these cone-shaped or dome-shaped hills are actually made of grass-covered limestone. The domes vary in sizes from 30 to 50 metres (98 to 160 ft) high with the largest being 120 metres (390 ft) in height. Bohol's "main attraction", these unique mound-shaped hills are scattered by the hundreds throughout the towns of Carmen, Batuan and Sagbayan in Bohol. The vegetation of the Chocolate Hills is dominated by hard grass species such as Imperata cylindrica and Saccharum spontaneum. Several Compositae and ferns also grow on them. In between the hills, the flat lands are cultivated with rice and other cash crops. However, the natural vegetation on the Chocolate Hills is now threatened by quarrying activities. 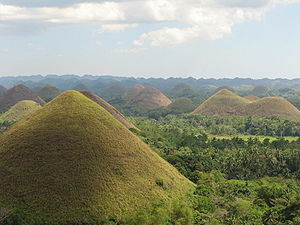 The Chocolate Hills are conical karst hills similar to those seen in the limestone regions of Slovenia, Croatia, northern Puerto Rico, and Pinar del Río Province, Cuba. These hills consist of Late Pliocene to Early Pleistocene, thin to medium bedded, sandy to rubbly marine limestones. These limestones contain the aboundant fossils of shallow marine foraminifera, coral, mollusks, and algae. These conical karst hills, called mogote, are created by a combination of the dissolution of limestones by rainfall, surface water, and groundwater and their subaerial erosion by rivers and streams after they had been uplifted above sea level and fractured by tectonic processes. These hills are separated by well developed flat plains and contain numerous caves and springs. The Chocolate Hills are considered to be a remarkable example of conical karst topography. Self-published, popular web pages present a variety of fanciful and less credible explanations about how these hills formed. They include sub-oceanic volcanism; limestone covered blocks created by the destruction of an active volcano in a cataclysmic eruption; coral reefs that were raised from the sea as the result of a massive geologic shift; and tidal movements. The lack of any exposed or associated volcanic rocks anywhere in the Chocolate Hills refutes the popular theories involving volcanic eruptions. These theories involving either a sudden, massive geologic shift, coral reefs being erupted from the sea, or tidal movements lack any collaborating evidence and support among geologists. The Chocolate Hills placed Bohol on the tourist map long before the beautiful white beaches of the island became major tourist destinations. The most famous and signature tourist attraction of Bohol, it is a prime tourist destination in the Philippines. This is because the Chocolate Hills are incomparable and is one of the country's most spectacular sceneries. Philippine President Gloria Macapagal-Arroyo, who admits that she is the No. 1 tourist of Bohol for having visited the province so many times, said: "Bohol is a major tourist province. The fame of the Chocolate Hills is not only known in the country but worldwide." The national government has chosen the Chocolate Hills as one of its "flagship tourist destinations". The Chocolate Hills Complex has a restaurant, hostel with swimming pool and an observation deck where one could view and even count the hills at the view deck 210 feet (64 m) above the ground. There are a total of 214 steps leading to the observation or view deck. Here one can view the landscape that is covered with more than a thousand Chocolate Hills. The Chocolate Hills Complex is composed of two hills developed into a resort. An observation deck on the higher hill offers a 360-degree panorama of the surrounding area. Sagbayan Peak is a 5-hectare (12-acre) mountaintop resort and recreation center. Its viewing deck offers a 360-degree perspective of the Chocolate Hills plus the blue sea that separates Bohol and Cebu. The peak now has a restaurant and a children's park with Bugs Bunny, Snow White and the Seven Dwarfs, and various other Toontown figures. Aside from the function hall and viewing deck, a hotel, swimming pool, driving range, a butterfly dome and a tarsier sanctuary are planned. A 100-hectare (250-acre) golf course is also planned. Patria Aurora Roa, tourism director for Central Visayas, was happy to see the latest addition to Bohol's tourist attractions. This was echoed by Bohol Governor Erico Aumentado, who said: "The Sagbayan Peak is a welcome note for Bohol tourism."